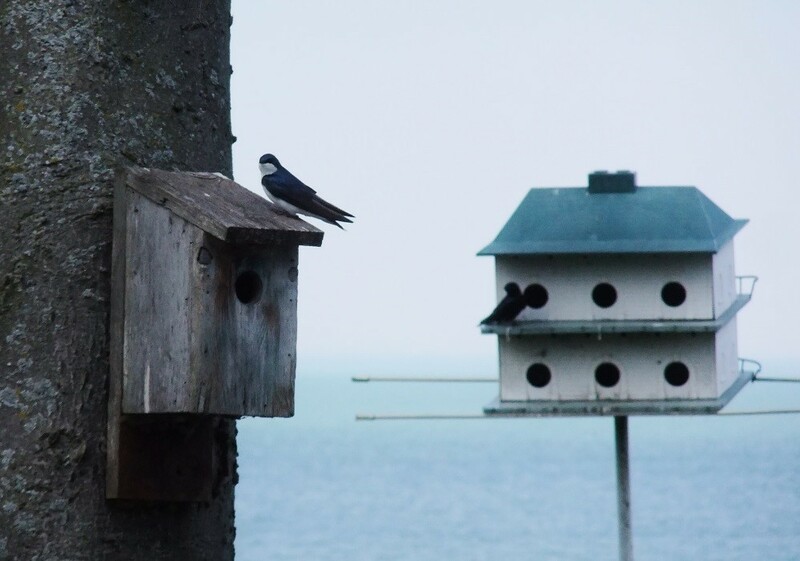 The Pelee Island Bird Observatory began its 14th season of migration monitoring on April 1st, 2017. The morning was cool and overcast, and notable mainly for the large number of waterfowl in Fox Pond: 60 birds of 10 species, including Canada Geese, Wood Ducks, Buffleheads, Common Goldeneye, Northern Shovelers and two American Coots. Red-Winged Blackbirds and Common Grackles were very much in evidence, especially around Fox Pond, and their rasping, creaking calls could be heard all along Fish Point. American Robins and Northern Cardinals were also common. Stormy weather and strong north-west winds on April 6th and 7th led to fewer songbird sightings, though the Tree Swallows appeared to be invigorated by the high winds and were seen in large numbers flying over the lake. Bonaparte’s Gulls were also very active. The ducks stuck mostly to Fox Pond, where the waters were calm, and a Ruddy Duck and Ring-Necked Duck seen on April 6th were new for the season. More songbirds appeared as the weather calmed down and temperatures increased. The first Myrtle Warblers and Ruby-Crowned Kinglets were seen on April 8th, along with the first Belted Kingfisher, which was fishing in Fox Pond. Slate-Coloured Juncos were frequently seen in flocks feeding along the beach, occasionally accompanied by Swamp Sparrows, Field Sparrows, American Tree Sparrows and Chipping Sparrows. The warmer weather also caused the local insects to become more active, to the benefit of the birds: a small flock of Golden-Crowned Kinglets was observed feeding on a hatch of midges at the edge of Fox Pond, and the numbers of Tree Sparrows seen flying over the trees increased. The ducks took advantage of the gentler winds to move out onto the lake – hundreds of Red-Breasted Mergansers were counted swimming and flying over the lake on the 10th, and a large raft of Scaup species had assembled off the east side of the tip on April 11th. The highlight of this migration monitoring period was a shrike that was seen on census on April 13th at the end of Fish Point. Unfortunately it was a very wary bird and remained at a distance, making it difficult to say for certain if it was a Northern Shrike or a Loggerhead Shrike, but the balance of probability seems to indicate that it was a Loggerhead. The field markings that were visible (a wide eye band and the absence of white eye ring) were typical of a Loggerhead, and the date is another point in favour of that identification: Northern Shrikes migrate much earlier, and would typically have already passed through southern Ontario by the end of March. PIBO staff returned later in the day to try and get a closer look at the bird, but it has not been seen again. Loggerhead Shrikes are an endangered species in Ontario, and winter in the southwestern United States. Very few raptor species have been seen so far: Bald Eagles have been seen the most consistently, and Cooper’s Hawks have been observed on a couple different occasions as well. A Merlin flew over Fish Point on April 5th. On most afternoons, large kettles of migrating Turkey Vultures can be seen riding the thermals over the island, often accompanied by Red-Tailed Hawks. A Broad-Winged Hawk was observed by two visiting Bird Studies Canada employees. Overall, the species counts have remained fairly consistent over the first two weeks of the migration season, with between 31 and 40 species being seen each morning. PIBO staff have begun setting up the mist nets in the banding station at Fish Point, and are looking forwards to using the new banding station that was generously built for us by Alex, Karen and Masha Bustard and Jon and Hanne Hettinga! Banding operations are expected to begin soon.